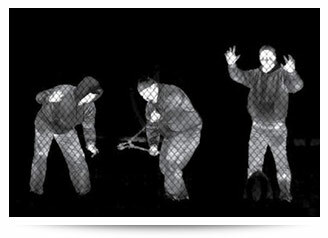 Our most recent project with thermal cameras was at a site in Sydney that is notorious with people self-harming. We needed to be able to see and detect people climbing over a cliff-top fence regardless of the time of day or weather conditions. In this scenario, thermal cameras were the perfect and only viable option considering the terrain and the limitations we faced. For best results, thermal cameras are positioned over the perimeter fence line where they are able to look along the fence, and the secure and non-secure sides are easily distinguished. Virtual alarm zones can be set within the camera so that if a person or vehicle approaches or crosses the perimeter line, an alert can be raised. The real value is that they do not require any form of lighting and are not negatively impacted by adverse weather conditions. Thermal cameras are perfect for monitoring large, open areas and can identify even subtle changes in conditions. Their real strength is in their flexibility and ease of installation. Thermal cameras are installed in much the same way as any CCTV camera and therefore do not require anything special from an infrastructure perspective. They can be connected to any video management system (VMS) in the same way as any other camera would be. They are inherently lower in resolution than the typical CCTV camera but their function is not to identify people, it is to identify a change in the environment. This means that in security applications, thermal cameras are often supported by more traditional CCTV cameras. While they start in price at around $6,000, they can be far more cost effective than microphonic sensing, external PIR’s or beams and are far less temperamental in many ways than those technologies too. This is because they are not impacted by environmental factors such as wind and rain and trees and foliage will not impact their performance. As with all security applications, there are many ways to achieve a specific outcome. Sometimes, all that is required is a lateral approach in our thinking when selecting the most appropriate security technologies.